The franchise offered in this Offering Circular is for the operation of a single, traditional, full service retail specialty coffee beverage store offering fresh roasted specialty whole bean coffees, traditional and espresso based coffee drinks, iced and blended coffee drinks, tea and tea-based beverages, fruit smoothies, sandwiches, salads, pastries and desserts, using the "It's A Grind" trade name and franchise system. The initial franchise fee for a single, traditional, full service It's A Grind Store is $30,000 (or $25,000 to $27,500 if part of certain area development agreements). The estimated initial investment required ranges from $241,500 to $ 439,500440,000. See Exhibit B for the name, address and telephone number of our agent for service of process in the State of California. Registration of this franchise by a state does not mean that the state recommends it or has verified the information in this Offering Circular. If you learn that anything in the Offering Circular is untrue, contact the Federal Trade Commission and the appropriate state or provincial authority as may be listed on Exhibit A. THIS OFFERING CIRCULAR IS PROVIDED FOR YOUR OWN PROTECTION AND CONTAINS A SUMMARY ONLY OF CERTAIN MATERIAL PROVISIONS OF THE FRANCHISE AGREEMENT. THIS OFFERING CIRCULAR AND ALL CONTRACTS AND AGREEMENTS SHOULD BE READ CAREFULLY IN THEIR ENTIRETY FOR AN UNDERSTANDING OF ALL RIGHTS AND OBLIGATIONS OF BOTH THE FRANCHISOR AND THE FRANCHISEE. AGREEMENT, OR (3) TEN BUSINESS DAYS BEFORE ANY PAYMENT. THE CALIFORNIA FRANCHISE INVESTMENT LAW REQUIRES THAT A COPY OF ALL PROPOSED AGREEMENTS RELATING TO THE SALE OF THE FRANCHISE BE DELIVERED TOGETHER WITH THE OFFERING CIRCULAR. IF THIS OFFERING CIRCULAR IS NOT DELIVERED ON TIME, OR IF IT CONTAINS A FALSE, INCOMPLETE, INACCURATE OR MISLEADING STATEMENT, A VIOLATION OF FEDERAL AND STATE LAW MAY HAVE OCCURRED AND SHOULD BE REPORTED TO THE FEDERAL TRADE COMMISSION, WASHINGTON, DC 20580 AND THE CALIFORNIA DEPARTMENT OF CORPORATIONS AT ANY OF ITS OFFICES. THESE FRANCHISES HAVE BEEN REGISTERED UNDER THE FRANCHISE INVESTMENT LAW OF THE STATE OF CALIFORNIA. SUCH REGISTRATION DOES NOT CONSTITUTE APPROVAL, RECOMMENDATION OR ENDORSEMENT BY THE COMMISSIONER OF CORPORATIONS NOR A FINDING BY THE COMMISSIONER THAT THE INFORMATION PROVIDED HEREIN IS TRUE, COMPLETE AND NOT MISLEADING. THE CALIFORNIA FRANCHISE INVESTMENT LAW REQUIRES THAT A COPY OF ALL PROPOSED AGREEMENTS RELATING TO THE SALE OF THE FRANCHISE BE DELIVERED TOGETHER WITH THE PROSPECTUS. To simplify the language in this Offering Circular, "the Company", "we", "us" or "our" means IAG Coffee Franchise, LLC, the franchisor; such terms do not include or refer to our officers, directors, shareholders, partners or members. "You" means the entity that executes the Franchise Agreement with us and each individual who has any ownership in that entity. We are a California limited liability company that was formed on October 27, 2000. We do business under our corporate name and the trade name "It's A Grind." Our principal business address is 6272 East Pacific Coast Highway, Suite E, Long Beach, California 90803. Except as noted below, we have no predecessors or affiliates. Our agents for service of process in those states requiring franchise registration are disclosed in Exhibit B to this Offering Circular. We franchise the right to operate retail specialty coffee beverage stores offering fresh roasted specialty whole bean coffees, traditional and espresso based coffee drinks, iced and blended coffee drinks, tea and tea-based drinks, fruit smoothies, bagels, muffins, scones and assorted bakery products. The franchise described in this Offering Circular is a license to develop and operate a single It's A Grind store (the "It's A Grind Store") at a designated location (the "Authorized Location"), which is usually located in a shopping center or a free-standing building. Your Franchise Agreement authorizes you to use the "It's A Grind" trade name and service mark in connection with your operation of an It's A Grind Store and permits you to operate your It's A Grind Store pursuant to a format and system specified by us (the "System"). We and It's A Grind, Inc. created and developed the System for the efficient management and operation of clean, attractive, distinctive, high quality, retail, specialty coffee stores. You must pay certain fees and make certain investments. Other material aspects of the franchise are described in this Offering Circular and in the Franchise Agreement included as an exhibit to this Offering Circular, which will govern the relationship between you and us. In addition to offering franchises for individual stores, we offer Area Development Agreements (the "Area Development Agreement") to persons that we consider to be qualified financially, operationally and organizationally, in terms of experience, and otherwise to develop and operate multiple stores. Under the Area Development Agreement, you agree to open a specified number of It's A Grind Stores within a defined geographic area in accordance with an agreed upon development schedule. You will sign a then-current franchise agreement for each It's A Grind Store you develop. The number of It's A Grind Stores, development area and schedule must be agreed upon by us prior to execution of an Area Development Agreement. Before the execution of each Franchise Agreement, we will deliver to you an Offering Circular describing the terms of our then-current franchise agreement and provide you with other relevant information. The Area Development Agreement you will sign will be in the form attached as Exhibit L to this Offering Circular. Grind, Inc. will continue to operate independently and is not obligated to participate in any programs conducted under the franchise program. It's A Grind, Inc. may develop and operate additional It's A Grind Coffee Stores in Southern California. Marty Cox is our president and one of our principal shareholders. (See Item 2 of this Offering Circular for Mr. Cox's biography). It's A Grind, Inc. is the owner of the trademark "It's A Grind" and the related intellectual property rights. We were formed on October 27, 2000, under the limited liability company laws of California to franchise the It's A Grind concept developed by Marty Cox and Louise Montgomery. Effective August 1, 2000, It's A Grind, Inc. and we executed a 25 year Trademark License Agreement whereby we were granted the exclusive rights to use the "It's A Grind" trademark and to franchise the It's A Grind concept throughout the United States. (See Item 13 of this Offering Circular) . Simultaneously, It's A Grind, Inc. and we executed a Store License Agreement granting us the right to use the It's A Grind Coffee Stores located at 4245 Atlantic Avenue, Long Beach, California 90807 and/or 4754 East Pacific Coast Highway, Long Beach, California 90804 as our prototype and training facilities. We began offering It's A Grind franchises in the State of California as of May 2001 We currently do not operate any company-owned It's A Grind Stores. Under our Trademark License Agreement and Store License Agreement with It's A Grind, Inc., It's A Grind, Inc. has the right to continue to operate the 4 It's A Grind Stores and the It's A Grind Lakewood Store, as well as additional It's A Grind Stores in Southern California and other areas in the future. These stores are not franchised stores. If It's A Grind, Inc. were to sell one or more of its existing It's A Grind Stores, these stores may not be part of the franchise system. We may offer the buyer of these stores the opportunity to convert to the It's A Grind franchise system after we comply with relevant franchise law disclosure and registration requirements. We have not offered and do not now offer franchises in any other line of business, but we may do so in the future. We and our affiliates reserve the right to distribute products, including products with trademarks, service marks, trade names and symbols licensed in the Franchise Agreement, through various other methods of distribution, and to undertake other business activities, including those related to the It's A Grind Stores without obligation to our franchisees. The market in which you will operate is well established and highly competitive. You will engage in the retail sale of traditional and espresso-based coffee drinks, iced and blended coffee drinks, tea and tea-based drinks, fruit smoothies, bagels, pastries and desserts to the general public. There is a significant amount of competition in the retail coffee beverage business, and you should expect to compete with other national, regional and local coffee beverage stores, restaurants, and other businesses offering competitive products and services, including members of established national or regional chains and franchise systems, some of which are older, larger and better financed than we are. We are not aware of any regulations specific to the operation of a retail coffee beverage store; however, in addition to laws, regulations and ordinances applicable to businesses generally, such as the Americans With Disabilities Act of 1990, the Federal and State Wage and Hour Laws and other laws related to employment rights and the Occupational Safety and Health Act of 1970, you may have to comply with certain federal, state and local health and sanitation regulations concerning the operation of your It's A Grind Store and state and local zoning and building code requirements governing the construction of the It's A Grind Store. Many states and municipalities require food service handlers to be licensed. There may be other laws applicable to your business and we urge you to make further inquires about these laws. You are responsible for knowing and complying with all laws and licensing requirements related to the operation of your It's A Grind Store. From September 1994 to the present, Mr. Cox has been President of It's A Grind, Inc., which owns and operates It's A Grind stores in Long Beach and Lakewood, California. He has also been our President since our inception on October 27, 2000. From October 1988 to December 2000, Mr. Shoeman was president of S&S Consultants, a franchise consulting firm in Houston, Texas. From May 1999 to July 2000, Mr. Shoeman was an associate of FranNet, the nation's largest franchise consulting firm, in Dallas, Texas. He has been our chief executive officer and director of franchise development since our inception on October 27, 2000. From April 1992 to June 2001 (excluding a hiatus from September 1995 to June 1996, when he was employed as roast master for Alakaf Coffee in Duluth, Minnesota), Mr. Foreman held a variety of positions with Diedrich Coffee Inc., including general manager of retail operations, roast master, quality assurance technician and plant manager of manufacturing. Mr. Foreman has been a member of the Specialty Coffee Association (SCAA), the trade association of the coffee industry, for ten years. He has been an instructor at the SCAA for 5 years, teaching classes in National Gold Cup Certification for Coffee Excellence, Roasting Techniques and Advanced Espresso Training. Mr. Foreman is a member of the Pacific Coast Coffee Association and the Roasters Guild. He has been our director of quality control from October 2001 to the present. Operations Manager and Franchisee Training Director: Meghan Hunt-Rider Beginning in February 1997, Ms. Hunt-Rider held a variety of positions at It's A Grind, Inc.'s retail operations in Long Beach, California, including barista, assistant store manager and store manager. From November 2000 to December 2001, she was in charge of It's A Grind, Inc.'s human resources and employment development . Her duties included interviewing, hiring, scheduling, classroom training, in-store training and ongoing performance evaluation. She became our operations manager and franchisee training director in January 2002. From March 1994 to the present, Mr. Phibbs has been the president of Retail Doctor, Inc., an independent consulting firm located in Long Beach, California that helps small and independent business owners compete with the larger chain stores. In 2001, Mr. Phibbs published a book entitled, You Can Compete, the Retail Doctor's Toots To Double Your Sales. A sought-after public trainer, Mr. Phibbs regularly addresses business organizations, corporations and business conferences. From September 1998 to December 2001, Mr. Phibbs was the chief operating officer for It's A Grind, Inc. in Long Beach, California. He has served as our director of identity and marketing since January 2002. Since February 1998, Mr. Olson has served as President of Olson and Associates, Long Beach, California, a national franchise development firm that has helped more than 40 emerging and established franchise companies expand their systems. Mr. Olson has been our vice president of franchise development since April 2002. Roo restaurants, a subsidiary of Prandium Incorporated, in Irvine, California. From April 2002 to August 2002, Mr. Wetzel was an independent management consultant in Orange County, California. He joined our organization as chief operating officer in September 2002. From January 1983 to June 1999, Mr. Klinger was chief financial officer and chief administrative officer for Arden Group, Inc., a publicly traded holding company in Compton, California. From June 1999 to December 2000, he was co-chairman, president and chief financial officer of Chicago Pizza & Brewery, Inc., a publicly traded company operating restaurant/microbrewery units in 5 states, with an office in Mission Viejo, California and most recently in Huntington Beach, California. From January 2001 to November 2002, Mr. Klinger was an advisor to various companies and individual investors in the restaurant, retail and real estate industries with an office in Rancho Palos Verdes, California. He has been a financial and business consultant to us since December 2002. Mr. Gapik was a Real Estate Manager (Southwest, Canada and West Regions) for Great Clips Inc., in Minneapolis, Minnesota from April 1998 to December 2003. He joined us as our Director of Real Estate in March 2004. From June 1997 to September 2001, Mr. Alderson was Senior Vice President for Starbucks Corporation in Fountain Valley, California. From September 2001 to the present, he has been an independent business consultant to various companies with an office in Olivenhain, California. Mr. Alderson has been a business consultant to the Company since January, 2004, and assumed his current position with us in June 2004. He is involved in managing training, operations and franchisee support functions, among other responsibilities. We employ various franchise brokers in different parts of the United States to assist us in identifying qualified franchise applicants. These franchise brokers are authorized to refer prospective franchisees to us. A list of these franchise brokers is attached as Exhibit N.
No litigation is required to be disclosed in this Offering Circular, except as set forth below and except as to any litigation information that may relate to our brokers (see Exhibit N). Another Ride. Inc.. Rex Puah. Debra Puoh. Mucho Mocha Coffee. Inc.. Env-Spitz. LLC, Russ Envart. Jason Spitzer. and Lacv Spitzer v. It's A Grind. Inc.. Steven Shoeman and Marty Cox. Superior Court of CA, County of Los Angeles, Case No. BC 309175. Filed January 16, 2004.
certain fees/commissions owed and to be owed to the Company and payments to be made by the Company; and the purchase by the Company of two operating It's A Grind stores from Another Ride, Inc., and all of the above settlements amount collectively to $770,000. The last of the settlement agreements was executed on May 16, 2004, and the agreements were retroactively effective as of February and April, 2004, respectively. IAG Coffee Franchise. LLC v Mucho Mocha Coffee. Inc.. Mike Silva and Francie Stout-Silva. American Arbitration Association, Case No. 73-181-00165-03 MAK. The Company filed a demand for arbitration against Mucho Mocha Coffee, Inc. ("MMC") and its owners, Mike Silva and Francie Stout-Silva (collectively the "Silvas"), the area franchise developers in Northern California, pursuant to an It's A Grind Area Development Agreement, dated March 7, 2002, in the Orange County, California office of the American Arbitration Association on April 0, 2003. The Company seeks damages estimated in excess of $475,000 for alleged breach of the Area Development Agreement, libel and slander, misappropriation of the Company's trade secrets, fraud by false promise, unfair competition and interference of contractual and prospective economic relationships with It's A Grind franchisees, as well as claims for declaratory and injunctive relief, specific performance of the non-competition and confidentiality provisions of the Area Development Agreement, accounting and other equitable relief and attorney's fees and costs. On April 25, 2003, MMC filed a counter-demand against the Company and two of the Company's executives, Marty Cox and Steve Shoeman, seeking damages and/or rescission in the amount of $192,200, plus unspecified, punitive damages and attorney's fees and costs, based on alleged claims of misrepresentations in the franchise disclosure documents regarding initial cost estimates, violation of California franchise laws and unfair competition, false advertising and for common law fraud. In an agreed-upon mediation proceeding, the parties agreed to dismiss their demands and settled their claim as described in the related action noted above. Dipti and Saniav Dave vs. IAG Coffee Franchise. LLC. American Arbitration Association, Case No. 002-B13-EIE (Filed: November 7, 2003). It's A Grind franchisees and area developers in Northern California, Dipti and Sanjay Dave (the "Daves"), filed a demand for arbitration against the Company, seeking damages in the amount of $50,000, plus unspecified punitive damages. The Daves -allege, and the Company denies, that the Company violated the California Franchise Investment Law and the California Business and Professions Code, Section 17,200 and committed acts of intentional and negligent misrepresentation with respect to the franchise disclosure documents presented to the Daves. The Daves allege that the initial investment estimates were understated. The Company has denied these allegations and will present substantial evidence showing the accuracy of the financial information provided in the Company's franchise disclosure documents. Additionally, on November 25, 2003, the Company filed a counter-demand against the Daves for (1) breach of the Daves' franchise agreement and area development agreement based on the Daves' refusal to proceed with their commitments under these agreements; (2) claims against the Daves for tortious interference with the Company's contractual relationships with other franchisees; and (3) defamation based on the false and malicious information that the Daves have disseminated to third parties. The Company is seeking damages estimated in excess of $226,000 plus punitive damages, attorney's fees and costs. The Company expects to finalize ongoing discussions regarding a settlement, one of the terms of which may provide for a cash payment by Company of less than $40,000. No person previously identified in Items 1 or 2 of this Offering Circular has been involved as a debtor in proceedings under the U.S. Bankruptcy Code required to be disclosed under this Item. You pay us an initial franchise fee of $30,000 by cashier's check or bank wire transfer in a lump sum when you sign your franchise agreement. Once paid, the initial franchise fee is fully earned and not refundable. All prospective franchisees who acquire a single It's A Grind franchise agreement pay the same initial franchise fee. If you acquire 3 or more It's A Grind franchises under an area development agreement, your fees will be lower, as explained below. If you are signing a franchise agreement under an It's A Grind Area Development Agreement, see below. Upon execution of an Area Development Agreement, you pay us a Development Fee equal to $10,000 times the minimum number of It's A Grind Stores to be opened under your Development Schedule. Once paid, the Development Fee is fully earned and not refundable. C. $25,000 for each It's A Grind Store under your Area Development Agreement if you develop and operate five or more It's A Grind Stores. We will apply $10,000 of the area development fee against each of the franchise agreements that you sign under your Area Development Agreement. When you sign your Area Development Agreement, you pay us the initial franchise fee for your first It's A Grind Store to be opened under your Area Development Agreement. You submit documents required by us, including our General Release of All Claims, excepting only (where such releases are expressly prohibited by applicable law) those claims solely related to the offer and sale of the new Franchise, and pay the initial franchise fee for each additional It's A Grind Store to be opened under your Area Development Agreement on the earlier of (1) the execution of the lease for that It's A Grind Store or (2) six months before the latest date that the It's A Grind Store must be opened, as described in your Development Schedule (attached as Exhibit ADA-HI to your Area Development Agreement). As noted in Item 2, above, we may use franchise brokers to assist us in identifying qualified franchise candidates and will pay them a portion of the initial franchise fee for their assistance. Additionally, we currently have a franchisee referral program and pay participating franchisees a referral fee for leads to qualifying candidates who acquire a franchise, subject to program criteria. This referral program is subject to change and/or elimination by us at any time. Note 1: All fees are non-refundable. Note 2: You pay us, without set-off, credit or deduction of any nature, a continuing royalty fee of 6% and a national development fund fee of 1% of your gross sales (see Note 3) each week during the term of your franchise agreement. If we request, you must send us a weekly report showing the computation of your continuing royalty fee and all other fees and amounts payable under your franchise agreement using our forms. We may access or "poll" by telephone, internet or other technology, remotely or on-site your computer system and business records to collect information and to verify your gross sales and all fees payable under your franchise agreement. Note 3: "Gross sales" includes all sums charged by you for products and services in the operation of your It's A Grind Store, whether for on-site or off-site consumption, less sales or excise taxes. Note 4: You must participate in our "enterprise" system, or similar system as we determine, and the customer gift card program arranged or provided by us. These programs allow you to set up various e-mail alerts, to generate detailed sales, inventory, product mix, employee performance, labor scheduling and payroll reports and to record and report sales activities and gift card sales and redemption. These programs also allow us to access or poll your sales and operational activities. pay the related amounts to each vendor for your account.) (See Item 11, "Computer System.") This amount may change from time to time, as changes occur in the programs, vendors and fee arrangements with vendors. You must pay all current fees at the current rates and all future fees at rates that we establish in our reasonable discretion. We take into consideration our ongoing costs charged by vendors, research, development and programming expenses and reasonable management, administrative and overhead expenses, as well as other expenses reasonably related to these programs before we decide the change the amount of the fees. Unless we tell you otherwise, this fee is payable at the same time and in the same manner as the continuing royalty fee is paid. (See Note 5.) This fee is cumulative of other expenses and costs for the purchase (or lease) of cash registers, computer systems, operating, bookkeeping and other necessary software, internet service provider fees and related charges. You and ail other It's A Grind franchisees are charged the same rate for these programs. We may commingle these fees that we collect from you with our other monies. Except as to fees that you actually pay to us for the enterprise system and the customer gift card program, you must indemnify, defend and hold us harmless for all of your obligations and liability for your participation in these programs. Under our cooperative gift card program, you will report weekly to us the totals for all gift card "sales" and remit to us the total proceeds from gift card "sales," as well as report to us weekly all "redemptions" transactions for gift cards presented by your customers, and we will reconcile your account and credit you for the full value of all gift card transactions redeemed by you weekly regardless of the It's A Grind Store that issued each gift card. | agreement as Exhibit Gt3FA-III, authorizing an electronic debit, and to give us any information that we need for this authorization. You cannot attend the initial training program unless we have received the Electronic Debit Authorization Agreement before the start date of the initial training program. Each Thursday, we will draft (withdraw) your enterprise system and gift card program fees and your royalty fee and national development fund fee and any other amounts you owe us directly by electronic funds transfer or otherwise from your bank account based on transactions completed by you during the prior week starting on Monday at 12:01 AM and ending at midnight the following Sunday. At least quarterly, we will provide you with an adjustment for any over or under payment of fees that you paid during the prior period. You must install at your expense and use any pre-authorized payment and computerized point.of sales systems, credit verification systems, automatic payment systems, electronic funds transfer systems, or automatic banking system that we in our discretion may require to fulfill any business purpose reasonably related to the operation of your franchise and the franchise system or to permit you to make all required payments to us by automatic bank transfer. You must maintain account balances sufficient to make all payments due us by electronic transfer. You must reimburse us for any charges incurred by us if there are insufficient funds in your account to pay a fee. Any insufficiency in your account to pay us the required fees will be a default under your franchise agreement. computer system to determine you weekly gross sales figures, then we are authorized to estimate these fees and to draft (withdraw) by electronic transfer an amount from your bank account for the continuing royalty fee and the national development fund fee with respect to the prior accounting period equal to the amount withdrawn for the most recent week plus 10% as an estimate of the accounting period's continuing royalty fee and the national development fund fee, plus the other fees you then owe us. If you pay, or we receive, a lesser amount than the full amount due us, we have the right to apply the payment against the longest outstanding amount due us. We can accept any check or payment in any amount without prejudice to our right to recover the balance of the amount due or to pursue any other right or remedy. No restrictive endorsement or statement on any check or payment or in any letter accompanying any check or payment or elsewhere from you will be an accord or satisfaction or will bind us or any of our affiliates. Our or any of our affiliates' acceptance of any payments made by you are not a waiver of any breach or default of any provision in your franchise agreement. Despite any designation by you, we can apply any payments made by you, or on your behalf (and apply any amounts owed to you or any of your affiliates by us or any of our affiliates) to any of your past due indebtedness for continuing royalty fees, national development fund fees, enterprise system fees, gift card program fees and other amounts owing to us or any of our affiliates, or any interest or other indebtedness that you or any of your affiliates owe to us or any of our affiliates. Note 8: Amounts due to us (except interest on unpaid amounts due) not paid when due bear interest from the date due until paid at the rate of 1.5% per month, or the highest rate of interest allowed by law. We can also recover our reasonable attorneys' fees, costs and other expenses incurred in collecting amounts owed by you. Note 9: We can audit your financial information at any time during normal business hours without prior notice at your It's A Grind Store. If your have underpaid any fees or amounts due us, you must immediately pay us the underpaid amounts plus interest from the date originally due until the date of payment, at the lesser of 1 %% percent interest per month, or the highest rate of interest allowed by law. If an audit is done because you failed to furnish us reports, supporting records or other required information or if the underpayment exceeds 2% of your Gross Sales for any period covering the audit, you must also reimburse us for all costs of the audit including travel, lodging, wage expense and reasonable accounting and legal expense. the transfer, including without limitation, legal and accounting fees, overhead, credit and other investigation charges and evaluation of the transferee and terms of the transfer. Upon the signing of the new franchise agreement, the transferee must pay us a new franchisee training fee of $10,000, which is used to help defray the expenses that we incur in providing training to the new franchisee. Both the $10,000 new franchisee training fee and the $5,000 transfer fee are nonrefundable. Note 12: Under certain circumstances, in the event of your death, disability or default under your Franchise Agreement, we may have the right to take over the management of your It's A Grind Store, in which case you must reimburse us for our expenses plus reasonable management fees. Note 13: You must indemnify, defend, and hold harmless us, our affiliates, and our respective officers, directors, shareholders, managers, members, consultants, agents, attorneys, accountants, brokers, representatives or employees from and against any and all losses, costs, expenses (including attorney's fees at all levels), damages and liabilities (a) that arise out of or relate to the negligence, breach of contract or other civil or criminal wrongdoing of you, any of your affiliates and any of your respective officers, directors, shareholders, managers, members, agents, attorneys, accountants, brokers, representatives or employees, or (b) that result, directly or indirectly, from or pertaining to the conduct of your business. We may appoint our own attorney. You waive and release all claims against us for damages to property or injuries to persons arising out of or relating to the operation of the It's A Grind Store, including any claims currently unknown to us and arising at any time during the term of your franchise agreement. 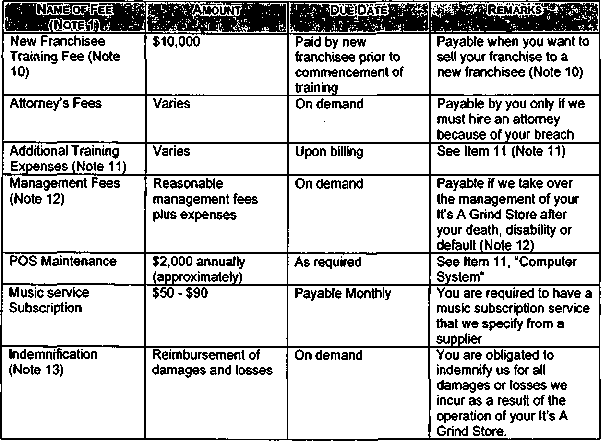 Note 1: All fees are nonrefundable; the fees are cumulative of the fees you pay in connection with the operation of each It's A Grind franchised store. Note 2: These fees are imposed by and are payable to us. Note 3: You pay us continuing royalty fees of 6% of gross sales for each It's A Grind Store that you develop under your Area Development Agreement. The amount of the continuing royalty fee for each It's A Grind Store that you develop is as specified in the applicable then-current Franchise Agreement signed by you and us for that It's A Grind Store, except as may be modified by your Area Development Agreement. We reserve the right to increase the rate of continuing royalty fees in the then-current Franchise Agreement. However, the Area Development Agreement provides that so long as you and all of your affiliates are not in default under any agreement with us, the continuing royalty fee for each of your It's A Grind franchises will remain at the current 6% of gross sales rate, even though we later increase the rate on new It's A Grind Franchise Agreements. Except as modified by your Area Development Agreement, you pay us all other fees and payments under each It's A Grind Franchise Agreement that you sign as stated in each agreement. (See Note 5 below). Note 4: Under the Area Development Agreement, you may offer securities or partnership interests ("securities") to the public, by public or private offering, if we give you our prior written consent. We must review all the documents for your offering. For each proposed offering, you must pay us a non-refundable minimum fee of $2,000 or such greater amount as is necessary to reimburse us for our reasonable costs and expenses associated with reviewing the proposed offering, including, without limitation, legal and accounting fees. B. Within 30 days after you receive the notice of default, you must pay us a monthly royalty fee of $2,000 by the first day of each month for each It's A Grind franchised store that you have not opened in accordance with your development schedule; you must continue to pay this monthly royalty amount until you open the required number of It's A Grind franchised stores as listed on your development schedule. This monthly royalty is non-refundable and nonassignable, and it may not be applied towards the payment of any other of your obligations. We may immediately terminate your area development agreement if you do not timely make these payments. If you do not meet your development schedule in any two consecutive development periods, we may terminate your area development agreement, and you will lose all rights granted under the area development agreement and forfeit any payments made under the development schedule. Airlines, hotels, car rental companies, restaurants, etc. Note 1: We do not finance any fees. The Initial Franchise Fee is non-refundable. The $30,000 Initial Franchise Fee is for a single It's A Grind Store. We will apply $10,000 of the development fee against each of the franchise agreements that you sign under your Area Development Agreement. When you sign your Area Development Agreement, you pay us the initial franchise fee for your first It's A Grind Store to be opened under your Area Development Agreement. You pay the initial franchise fee for each additional It's A Grind Store to be opened under your Area Development Agreement on the earlier of (1) the execution of the lease for that It's A Grind Store or (2) 6 months before the latest date that the It's A Grind Store must be opened, as described in your Development Schedule (attached as Exhibit ADA-III to your Area Development Agreement). See Item 5 of this Offering Circular. Note 2: The cost of leasehold improvements will vary depending on many factors, including, without limitation, square footage, market climate, labor market (e.g., prevailing wage rates, union labor restrictions, etc. ), type and condition of the facility, location, condition of the leased premises and price difference between various suppliers and contractors. These estimates assume you are establishing a customary It's A Grind Store in a typical neighborhood shopping center or free standing building . In some circumstances, it may be possible to convert an existing free standing building, a pre-existing facility, a multi-level office or commercial facility, regional mall, food court, etc. with our consent as long as it conforms to all of our standards and specifications. It's A Grind, Inc. established one It's A Grind Store in a multi-level office complex in which the leasehold improvement costs were $190,000. The costs of leasehold improvements are your sole responsibility and will vary depending upon your negotiations with the landlord or third parties prior to occupancy, or they may be financed through the landlord or third parties. If you are leasing in a newly developed shopping center, the landlord typically will deliver to you a "shell" with no improvements, in which case, you may be able to negotiate for "tenant improvement" credits towards your construction costs. This is an important factor for you to consider in choosing a location. You should consider consulting with a qualified, licensed contractor for cost estimates before signing the lease. You are responsible for obtaining all necessary permits and licenses required for the location, construction, renovation or operation of your It's A Grind Store. | interest rate, and the length of any financing or leasing arrangements are subject to negotiations between you and your lender or leasing company. Note 4: If you do not own adequate space, you must lease retail space for your It's A Grind Store. Typical locations for an It's A Grind Store are strip shopping centers in suburban commercial areas having 1,000 to 1,500 square feet. Rent is estimated to range between $2,500 and $7,500 per month and will vary significantly depending on such factors as square footage, market climate, type of facility, location (relating to the location of the shopping center within a community and to the location of the leased premises within the shopping center), condition of the leased premises, the age and popularity of the shopping center where the leased premises is located, etc. If the cost of leasehold improvements is amortized into your lease, your monthly lease rates could significantly increase. (See Note 2 regarding leasehold improvements). Note 5: The professional fees include payments to architects, accountants and attorneys. These estimates assume that you choose your own architect to prepare your architectural drawings, in which case, you must pay our architect a total of $2,000 for the preparation of a preliminary "test fit" drawing ($500) and for review of the architectural drawings prepared by your architect and for customary consultations with your architect on related issues ($1,500). Our architect reserves the right to charge additional fees for extraordinary services beyond those provided in connection with the typical build-out of an It's A Grind Store. If you choose to retain our architect as your principal architect to prepare your architectural drawings, then our architect will waive the $500 "test fit" fee and the $1,500 review and consultation fee. In such case, you will negotiate with and pay directly our architect for the necessary architectural services. The above estimates also assume that your legal, accounting and other professional fees will be based on the establishment of a sole proprietorship ownership model and a simple lease review. If you establish a corporation or other legal entity and/or conduct more extensive negotiations regarding your ownership organization or regarding your lease, then your professional fees will increase accordingly. Note 6: You are required to maintain adequate insurance coverage prior to occupying the lease space. The estimated expenses included in the above Chart include estimates for your initial premium for the required property and public liability insurance and is the estimated cost per year per It's A Grind Store. The cost of other coverage is not included in the estimates. (6) If you have company-owned vehicles, automobile liability insurance for owned and non-owned automobiles including personal injury, wrongful death, and property damage with single limit coverage of at least $1,000,000. We may from time to time require you to upgrade your insurance as to policy limits, deductibles, scope of coverage, rating of carriers, etc. Note 7: Training costs will vary depending upon the number of persons attending the training, the length of stay, the distance traveled, the lodging and stores selected, and type of transportation utilized. Note 8: The estimate for opening inventory is based on all of the inventory required to open your It's A Grind Store. Note 10: These estimates for your initial start up expenses include rent, payroll costs and working capital for the first six months of operation. These figures are estimates, and we cannot guarantee that you will not have additional expenses starting the business. These estimates do not provide for an owner's draw. You must have additional monies available, whether in cash or through a line of credit, or have other assets that you may liquidate, or against which you can borrow, to cover your personal living expenses and any operating losses sustained during the start-up and development stage of your business. The amount of necessary reserves will vary greatly from franchisee to franchisee depending upon many factors including, without limitation, your personal requirements, the gross sales and success of your business, which will be affected by your management skill, experience and business acumen, local economic conditions, the local market for our menu items and competition. We cannot provide you with any assurance that your business will become profitable within 90 days, if ever. We recommend that you have available additional resources to help finance the start-up phase of your business and to cover other contingencies.